The Export to Snapfish plug-in allows you to export and publish photos from Adobe Lightroom directly to the Snapfish Online Photo Service. The number of photos in a single albumis limited to 10. Snapfish Export Options and Snapfish Publish Options sections are unavailable (grayed out). Compatibility with the recent changes at Snapfish backend. Fixe the index error introduced in version 3.4.1. Fixed HTTP Error 500 when attemting to upload to a deleted album. Fixed the "Unexpected data returned from getAlbums:? :0: attempt to concatenate field 'thumbnailEncryption' (a nil value)" error when the current album doesn't have a cover photo. Albums marked for deletion no longer appear in the list. Fixed "the requested resource no longer exists on the server" error when attempting to upload a photo. Implemented support for the new Snapfish API. Completely redesigned the automatic update mechanism.. Fixed the issue with authenticating VirginMedia accounts. Publish Service: Improved support for watermarks. Fixed issues with accessing albums after a recent change at Snapfish. New Feature: Reclaim Photos. Now you can download photos from Snapfish to your hard drive. Associate Images: improved association by capture time. Fixed the error when the use has no albums at Snapfish. Associate Images: added the ability to specify the time difference between the local computer and the server to be able to associate photos by capture time when machines are in different time zones. Added the ability to upload photos in the original JPEG format without any additional processing. Fixed the issue with authenticating at some international sites. Fixed the error when creating new albums. Added support for accounts hosted at snapfish.de and improved support for other international accounts. Added support for Snapfish accounts hosted at snapfish.at (Austria). Now the plugin's license can be deactivated and moved to another computer. Publish Service: now image settings (size, resolution, quality level, color space) can be individually customized for each album. Fixed the issue with user authetnication at some sites other than snapfish.com. Publish Service: renaming unpublished albums now works correctly. Fixed the "bad URL" error when Snapfish server is unavailable. Fixed issues with authenticating at some international sites. Fixed the "bad argument #1 to 'measureStringHeight'" error when entering wrong credentials. Fixed the issue with re-publishing albums that were removed on Snapfish. Improved error handling and stability in situations when HTTP failures occur. Fixed the "Assertion failure" error with some international Snapfish accounts. Photo captions on Snapfish now reflect the metadata Title field. Export Presets: Fixed the issue with populating the Password field when working with multiple accounts. Publish Service: Now you can import existing online albums into the publish service. Publish Service: Added the ability to refresh publication status for existing photos and check their URLs. Publish Service: Now you customize album cover photos. Publish Service: Fixed the issue with "Go to Published Photo" navigating to the wrong photo. Publish Service: Now "Go to Published Photo" works correctly. Fixed the issue with uploading photos to very old albums. Fixed the issue with authentication failures for users in the Eastern Hemisphere (e.g. Asia, Australia). NOTE: Version 1.9.7 has been skipped. Fixed the "attempt to index local 'albumProperties' (a nil value)" error when uploading into the default album, which Lightroom creates automatically when creating new publish services. Fixed the error when exporting photos to an empty album. The plug-in is now compatiblie with Lightroom 4. Fixed the issue with user authentication when the password contains some special characters. Added the option to retry a failed upload. Fixed support for Virgin Media Broadband accounts. Fixed an error when re-exporting a photo that had already been exported to Snapfish. Fixed the issue with logging in after a recent change on the backend. Improved performance of the user authentication step. Fixed issues with user authentication for Snapfish co-branded services - Virgin Media, UIMDE, etc. Improved performance for accounts hosted by Snapfish co-branded services. The "Logged in as" status line now displays the full name of authenticated user. Added a number of metadata fields to keep track of photos exported via the plug-in. Added support for Snapfish New Zealand. Added support for German Snapfish accounts hosted on www3.snapfish.de/uimde. 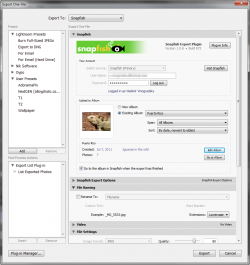 Fixed errors when using multiple publish services for Snapfish. Fixed the "bad URL" error in Lightroom 2 for Mac OS. Fixed a couple of backward compatibility issues with Lightroom 2. Fixed the "bad argument #1 to 'ipairs' (table expected, got nil)" error when there are no albums in the account. Added the ability to customize the sort order of photos in published albums. Fixed the issue with album titles not being applied during publishing. Fixed a number of issues related to the new beta API used by Snapfish on some of the accounts. Fixed the issue with duplicating photos after re-publishing. Fixed the issue with creating new albums when re-publishing an existing album. Added support for yet another Snapfish co-branded service - Brack.CH. Added support for non-English services of Snapfish, including German, French, Italian, Dutch, Spanish, Norwegian, Swedish, Portuguese, Japanese, and Chinese. Fixed several issues related to re-establishing server connection after a period of inactivity. This version fixes a couple of issues specific for Lightroom 2. Added support for Publish Services in Lightroom 3. Added support for another Snapfish co-branded service - Spectra (Ireland). Added support for another Snapfish co-branded service - Virgin Media (UK). Improved the stability when the server returns random itermittent connection errors. Now the plug-in is compatible with Lightroom 3.2 Release Candidate, Windows and Mac OS. 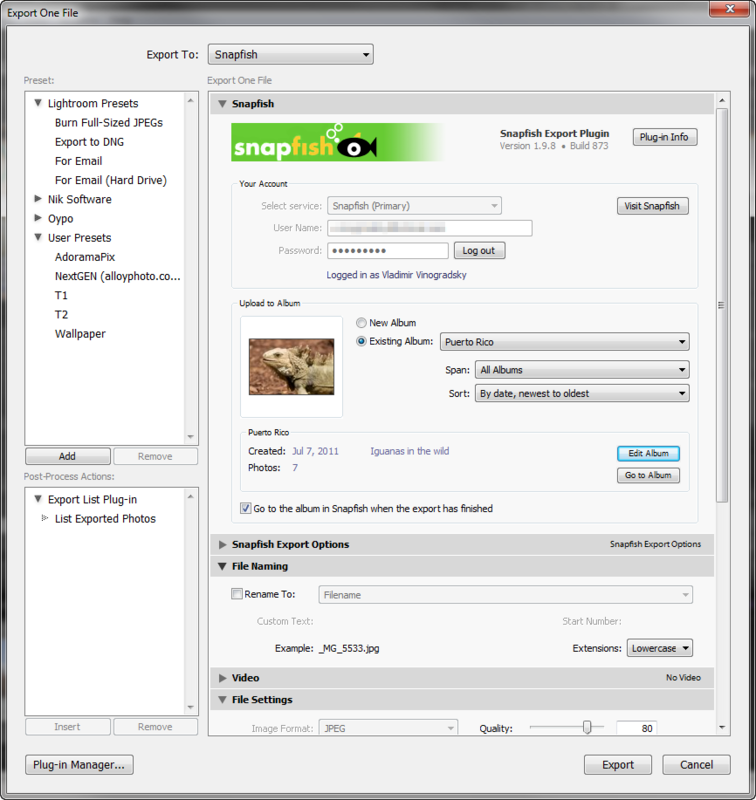 The plug-in now supports Snapfish co-branded services, such as Earthlink. Fixed intermittent issues with logging in. Fixed the “bad argument #1 to ‘sub’” error. Removed the 6MB upload size limit. Automatic checking for plug-in updates now works correctly. Fixed links to the home and registration pages of the plug-in. Why do you limit the upload file size to 6MB when there is no such limitation on the part of Snapfish? Such a limitation eliminates the usefulness of this plug-in, at least for me. I am very much hoping that you will remove this limitation in a future update. I think you are right, there appears to be no size limit for Snapfish uploads. I’ll remove the limitation in the next update. Thanks, I have confirmed and already fixed the bug. I am going to upload the update as soon as my internet connection allows me to (hopefully, tonight). I am currently on a trip and the local intenet configuration doesn’t let me use certain ports that are necessary to manage my files on the site. I understand that snapfish has worldwide upload sites (e.g. UK, Singapore etc) — is there any way to select a snapfish upload site which is nearest to my geographical location? You should choose the service (country) where you created your Snapfish account. Where can I am find the newest Version from the Snapfisch Plugin? Or is this Version 192 the newest? Whatever version is current posted on the plug-in’s home is the latest. You can also update the plug-in to its latest version using the auto-update feature (or from the Plug-in Info screen). I just started using the Snapfish upload app for Lightroom 5. When I use the app to'publish' I get a message that my image is too large and it should be scalled down. I don't see an option to do that under the LR publish option. How do I make that work? Make sure you keep the “Resize to Fit” option selected. Set the size to match your target print size. Quality 80-90% and Resolution to 240 pixels per inch. Just use your serial number to activate the plugin on the other computer – your serial number is good for several activations. If you no longer use the old PC, deactivate the license to free up the activation pool for another installation. The Adobe Exchange link for this plugin doesn’t seem to be working. Has it been temporarily or permanently removed? Ah, thanks for pointing that out! The link was for the old Adobe Exchange site. I removed the link to avoid confusion.